The academic year consists of two semesters and optional terms in December/January and May. The semesters are 16 weeks in length: 14 weeks of instruction with the remaining time consisting of breaks, holidays and an examination period. Cardinal Term offers students an opportunity to concentrate on a single course not typically offered during a regular semester, to engage in a research project, or to participate in a travel course. May Term offers students an opportunity to concentrate on a single course not typically offered during a regular semester, to engage in a research project, or to participate in a travel course. For students who wish to accelerate their studies, Otterbein offers a Summer Semester beginning in mid-May and ending in mid-August. Courses vary in length, but most are held over either a 7-week or a 14-week period. Summer Semester course offerings are announced in January at which time registration opens. by evidence of student achievement that is an institutionally-established equivalency that reasonably approximates no less than: (1) one hour of classroom or direct faculty instruction and a minimum of two hours of out-of-class student work each week for approximately fifteen weeks for one semester or trimester hour of credit, or ten to twelve weeks for one quarter hour of credit, or the equivalent amount of work over a different amount of time; or (2) at least an equivalent amount of work as required in paragraph (1) of this definition for other activities as established by an institution, including laboratory work, internships, practica, studio work, and other academic work leading to the award of credit hours. One semester credit hour will be awarded for a minimum of 750 minutes of formalized instruction that typically requires students to work at out-of-class assignments an average of twice the amount of time as the amount of formalized instruction (1,500 minutes). It is acknowledged that formalized instruction may take place in a variety of modes. Class standing is based on total semester hours earned. Academic standing is a benchmark used to assess appropriate academic achievement. An undergraduate student who maintains the minimum cumulative grade point average (GPA) as required in the chart below is in good standing. Academic Probation occurs when an undergraduate student’s cumulative grade point average is below the minimum levels established. Suspension transpires when a student does not meet the terms of probation (first-time suspension is one semester; second-time suspension is one year; and third time is dismissal for five years). Undergraduate Academic Standing is overseen by the Office for Academic Affairs. Note: Once the suspension timeframe has been completed, readmission is through Academic Council, overseen by Academic Affairs. 3. The completion of one’s degree within a reasonable time period. Degree Completion: In addition to completing two-thirds of the credit hours attempted, a student must also complete his/her academic program within a reasonable timeframe, not to exceed 150% of the published length of the program-a student must meet all graduation requirements by the time the 192nd credit has been attempted (or the 225th credit if seeking a BA or BS in Public Accounting). All periods of attendance are counted towards the maximum timeframe. Prior to enrolling at Otterbein, students are assigned academic advisors. The advising process is an ongoing series of consultations between the student and the advisor. Advising involves both the development and communication of accurate information regarding degree programs, courses, resources, academic policies/procedures and career opportunities intended to help students in achieving their educational goals. Both the advisee and the advisor share the responsibility of being active participants in the advising process. However, the student is responsible for making decisions regarding personal and educational goals and satisfying all graduation requirements. Through individual instruction and collaborative learning, the Academic Support Center (ASC) helps students develop and strengthen the skills necessary to attain their academic goals. All ASC services are free of charge for Otterbein students. The ASC: offers courses in College Reading & Study Strategies and Argumentative Writing; coordinates course-specific academic support via Content Area Tutoring, the Math Lab, the Writing Center, and Supplemental Instruction; provides academic counseling related to learning, time management, organization, and study strategies; and, hires, trains, and supervises peer tutors who possess strong content knowledge, study strategies, and communication skills. The ASC serves a wide range of students: students struggling academically, students in need of accommodations, and high-achieving students wanting to learn more effectively. Students are encouraged to contact the ASC if they have concerns related to their learning, academic progress, or course work. The ASC also coordinates the University’s Disability Services program. Disability Services provides classroom accommodations, such as testing accommodations, note-taking assistance, and alternative media, to students with documented disabilities including learning disabilities, ADHD, physical disabilities, medical disorders, visual and hearing impairments, psychiatric disorders, and temporary diagnoses. The ASC is located on the second floor of Courtright Memorial Library. For additional information, please contact a member of the ASC staff at 614.823.1610 or visit our website: www.otterbein.edu/asc. The Center for Career and Professional Development offers resources and services including academic and career exploration, job and internship search skill-building, and assistance with resumes, cover letters, and mock interviews. Contact the Center for Career and Professional Development at 614-823-1456 or email us at career@otterbein.edu or visit us online at www.otterbein.edu/career. The Office of Disability Services (ODS) works closely with qualified students with disabilities to ensure they have equal access to an education and campus life. ODS provides student access through services, accommodations, and advocacy, as specified in Section 504 of the Rehabilitation Act of 1973 and the ADA Amendments Act of 2008. ODS serves all Otterbein students with documented disabilities including learning disabilities, ADHD, physical disabilities, medical disorders, visual and hearing impairments, psychiatric disorders, and temporary diagnoses. Some of the accommodations provided by ODS may include testing accommodations, note-taking assistance, alternative media, priority registration, interpreting services, and residence hall accommodations. All ODS services are free of charge for Otterbein students. ODS is located on the second floor of Courtright Memorial Library and is part of the Academic Support Center. The Center for Student Success serves as a resource center for students at Otterbein. The Center offers supplemental academic advising, as well as peer mentoring; helps students make individualized semester conversion plans, and refers students to different campus offices for help. The goal of the Center is to help students by serving as an advocate and removing barriers for success. The Center also coordinates support for students who are undecided in their major or are considering switching majors. The Center for Student Success is located next door to the Center for Career Planning (behind the Rock) in Barlow Hall. Otterbein accepts credits from two and four-year institutions that are fully accredited by the appropriate regional accrediting agencies. While there is no limit to the number of credits transferred from four-year institutions, a maximum of 64 semester hours may be transferred from all two-year institutions combined. Of the courses transferred to Otterbein from all institutions combined, a maximum of 8 semester hours will be accepted from college courses graded on a pass/fail basis. Only those courses with grades of C- or better will be considered for transfer. Minimum grade requirements for individual academic departments may vary. The actual grades are not transferred and thus will not be included in the Otterbein grade point average. Prior to the beginning of the semester in which the student first enrolls, current official college transcripts from all institutions previously attended must be submitted to Otterbein for evaluation. Violation of this requirement will place the student in jeopardy of dismissal. Official evaluations are not completed until all official transcripts have been received. An official evaluation of transfer credit will be completed by the end of the student’s first term of attendance. If a student’s academic credentials are from an institution outside the United States, a World Education Services, Inc. (WES) course-by-course evaluation of all postsecondary education must be provided. WES charges a nominal fee for this service. WES details and instructions are available at their website, www.wes.org. Otterbein accepts credit for military coursework listed on a military transcript with ACE recommendations. Course that do not align with specific Otterbein courses will be awarded general elective credit. All contents of the student’s admission file become the legal property of the University and are not returnable or transferable. 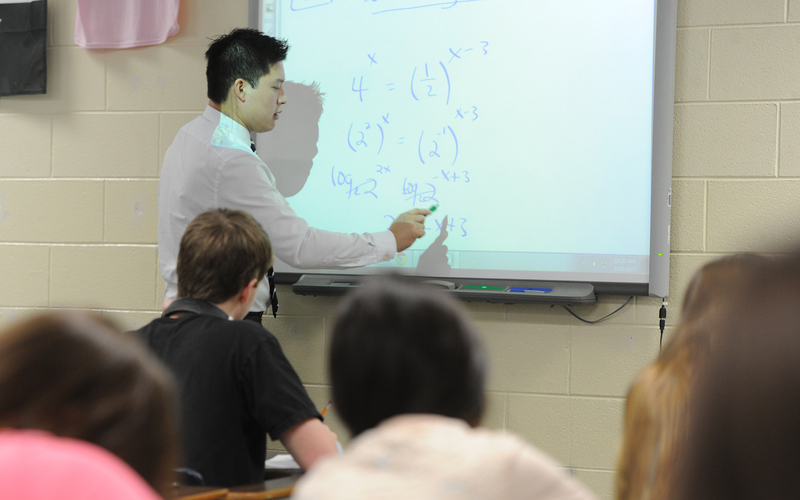 A student who receives a score of 4 or 5 on an Advanced Placement Test in high school will receive credit for the appropriate Otterbein equivalent course. Proficiency rather than credit will be noted for a score of 3 for any Otterbein equivalent course except Integrative Studies courses (INST) and Mathematics (MATH) courses or their substitutes. Exemption from INST courses and INST substitutes requires a score of 4 or 5. Proficiency means that the Otterbein equivalent course may be skipped when it is a required, prerequisite, or co-requisite course. Students may use their intellectual interests, academic backgrounds and experience to gain college credit through the following means. Students are not permitted to take CLEP exams once they have reached senior status (96 or more earned hours). Also, students who have already earned Bachelor’s degrees are not permitted to take CLEP exams. None of the hours may be used to fulfill the University’s residency requirement. Maximum credit = 40 semester hours. For additional information, contact the Office of Adult and Transfer Admission. An Otterbein academic department may decide to develop its own method of verifying a student’s knowledge of a course. If an examination is the method selected, a course syllabus and several sample questions will be made available to the student by the instructor providing the grade. A per-credit hour fee is charged for on-campus credit by examination or portfolio. An additional fee may be charged for a laboratory examination. Grading is made on a pass/fail basis. When an Otterbein exam is not successfully passed, a second attempt can only be made by taking the actual class. Failed departmental examination attempts are not recorded on the transcript record. IB Group 1 Courses - ENGL 1192. IB Group 2 Courses - Modern Language 1000 and 1100 which fulfills the University’s general education modern language requirement. IB Group 3 Courses - INST 2000 Interconnections series credit for subjects in anthropology, economics, geography, history and world religions. Four semester hours of general elective credit for subjects in business, information technology, philosophy and psychology. IB Group 4 Courses - INST 2400 Natural Foundations series credit for all subjects except in exercise, health and sport. IB Group 5 Courses - MATH 1250 for Mathematical Studies SL; MATH 1700 for Mathematics SL or HL; MATH 1700 and 1800 for Further Mathematics SL. IB Group 6 courses - INST 2600 Creativity and Culture series credit for all subjects. Students who do not have an IB diploma but who have taken Higher Level IB exams will receive credit on a case-by-case basis for examinations that match courses in the University’s curriculum. A score of 5, 6 or 7 is required. The official International Baccalaureate diploma should be submitted to the Admission Office in June following graduation. See Transfer Credit Policy above. Once an Otterbein Bachelor’s degree has already been awarded, students are not permitted to alter or enhance the transcript record at a later date by adding another major, a minor, repeating courses to improve the GPA, etc. Students may, however, earn a second Otterbein Bachelor’s degree as described below. If fewer than 32 semester hours are needed to complete the degree requirements, the remaining hours needed to reach 32 may consist of elective credit. For a description of the requirements for consideration to add an individualized major, click on the link below. For a description of the requirements for consideration to add an individualized minor, click on the link below. For a description of the residency requirements in majors and minors, click on the link below and then click on the specific program desired. The Family Educational Rights and Privacy Act (FERPA) affords eligible students certain rights in connection with educational records maintained at Otterbein University. 1. The right to inspect and review the student’s education records within 45 days after the day Otterbein University receives a request for access. A student should submit to the registrar, dean, head of the academic department, or other appropriate official, a written request that identifies the records(s) the student wishes to inspect. The school official will make arrangements for access and notify the student of the time and place where the records may be inspected. If the records are not maintained by the school official to whom the request was submitted, that official shall advise the student of the correct official to whom the request should be addressed. It the school decides not to amend the record as requested, the school will notify the student in writing of the decision and the student’s right to a hearing regarding the request for amendment. Additional information regarding the hearing procedures will be provided to the student when notified of the right to a hearing. The school discloses education records without a student’s prior written consent under the FERPA exception for disclosure to school officials with legitimate educational interests. A school official is a person employed by Otterbein University in an administrative, supervisory, academic, research, or support staff position (including law enforcement unit personnel and health staff); a person serving on the board of trustees; or a student serving on an official committee, such as a disciplinary or grievance committee. A school official also may include a volunteer or contractor outside of Otterbein University who performs an institutional service of function for which the school would otherwise use its own employees and who is under the direct control of the school with respect to the use and maintenance of PII from education records, such as an attorney, auditor, or collection agent or a student volunteering to assist another school official in performing his or her tasks. A school official has a legitimate educational interest if the official needs to review an education record in order to fulfill his or her professional responsibilities for Otterbein University. The University reserves the right to notify parents or guardians of “dependent” students, regardless of the student’s age or status, of conduct in health and safety emergencies, hospitalization, or where in the University’s judgment the health or well-being of the student, or others, is, or may be at risk. 4. Students, parents, and foreign government agencies supporting dependent students have access rights to the educational records maintained about them during their enrollment. a. “Dependent” means being listed as such on the parents’ annual federal income tax statement, or (in the case of foreign students) receiving at least 50 percent or more of their support from parents or foreign government agencies. b. Students who are independent of their parents must file an annual statement by September 30 to this effect on a form available in the Student Affairs office. c. Non-immigrant foreign students have agreed to give the U. S. Citizenship and Immigration Services (USCIS) access to certain information as is outlined on the non-immigrant’s form I-20 (page 2) or DS-2019 (page 2). Records pertaining to these students and documents are maintained in the Center for International Education and Global Engagement. a. Records in the sole possession of a professor, physician, counselor, psychologist or the law enforcement unit of Otterbein University. c. Recommendations for which the student has waived rights of access. Students have the right to file a complaint with the U. S. Department of Education concerning alleged failures by Otterbein University to comply with the requirements of the Family Educational Rights and Privacy Act (FERPA). The following grades from letter-graded courses are included in the calculation of the grade point average (GPA). The numeric equivalents to the letter grades are displayed with the % symbol. “IP” is the temporary symbol given when course requirements have not been met due to circumstances beyond the student’s control. An incomplete grade should only be considered when the majority of the work required for the course has already been finished. The pressures of a normal academic load or the desire to do extra work in the course are not sufficient reasons for granting an incomplete. A grade of IP may also be given for a Spring Semester travel course that has been designed to be completed in May Term. The amount of additional time permitted might be no more than a few days or weeks since it should be proportional to the student’s illness or absence, etc. while remaining fair to others who were enrolled in the course. The IP must be completed no later than the following applicable deadline or sooner if prescribed by the instructor: for Fall IP’s, the last day of the Spring classes; for Cardinal Term classes, the last day of Spring classes; for Spring, May Term and Summer IP’s, the last day of Fall classes. Due to extraordinary circumstances, an IP completion deadline may be considered for extension. To receive consideration, the student (not the instructor) must submit a written request/rationale to the applicable School Dean no later than the seventh Friday of the term the IP is due for completion. It is the student’s responsibility to contact the instructor to arrange for completion of the work, and it is the instructor’s responsibility to submit the final grade. When no grade is received, the default grade previously provided by the instructor will be assigned. Grades submitted to the Office of the Registrar are considered final unless (1) evidence of an error can be presented, or (2) the student is convinced his or her academic performance was evaluated on other than an academic basis or in a prejudiced or capricious manner. Grades may not be changed by arranging to complete additional work or by meeting criteria not in accord with those applied to all other students enrolled in the course. To appeal a grade, the student must consult with the instructor (or the department chairperson when the instructor is away from campus) no later than the following applicable deadline: for Fall and January Term grades, the end of Week Four of Spring Semester; for Spring and Summer grades, the end of Week Four of Fall Semester. Resolution and submission of the revised grade to the Office of the Registrar must occur by the end of those respective semesters. Signatures of both the instructor and the instructor’s department chairperson are required to change a grade. When a grading issue cannot be resolved through discussions with the instructor or department chairperson, the student may present evidence in writing to the Dean of school or program in which the course is taught indicating an error, the prejudicial basis, or the capricious manner used in evaluating his or her performance. In all cases, this step must be taken no later than five business days beyond the applicable 4th week deadline indicated in the previous paragraph. The Dean will consult with the student and instructor after which the appeal may be passed on to the Appeals Council for its consultation and judgment. The actual grade change, if deemed in order by the Appeals Council, shall be determined by the Dean in consultation with the student and the instructor involved (or the applicable Department Chairperson if the instructor is unavailable). Contact the Office of Academic Affairs to identify the applicable School Dean or the Dean of University Programs. Copies of official transcripts may be obtained for a nominal fee from the Office of the Registrar. An official transcript cannot be provided when there is an outstanding bill or a loan in default. Requests are filled within five business days. Order forms are available on campus or on the Office of the Registrar’s website, www.otterbein.edu. Degrees are granted at the end of Summer, Fall, and Spring Semesters. Students planning to graduate must request a Graduation Application at the Office of the Registrar one term prior to the term in which the degree is to be completed. It is the student’s responsibility to be aware of this requirement, to initiate the request and to sign/return the application on time. meet all outstanding financial obligations. Detailed information about the commencement ceremony is available at any time on the Office of the Registrar’s website, www.otterbein.edu. Through the Academic Council, which is a standing committee of the University Senate, an avenue for appealing academic policies is provided all students. Details regarding the appeal process are available from the Office of Academic Affairs. Minutes of past Academic Council meetings are on file in the Library. The Distinction Program has a long and useful tradition at Otterbein University. The program involves the design and participation in an independent project within the student’s major field of study. The project is carried out in consultation with an advisory committee consisting of a primary project advisor, another member of the faculty chosen by the student in consultation with the advisor, and one member of the faculty appointed by the Distinction Committee. An independent program of study offers the student an opportunity for personal growth within a chosen field of expertise that far exceeds that available in the classroom. A student in the program will perform independent scholarly activity as defined by the discipline. Students work closely with an advisor, an advisory committee, and prepare a written thesis. This is a collaborative effort that mimics the pursuit of an advanced degree and demonstrates the shared responsibility for learning that is so much a part of a liberal arts tradition. To be eligible for the Distinction Program, a student must have completed 64 semester hours of study with a grade point average of 3.4 or above. All potential candidates are notified by the Chair of the Distinction Committee during winter of the junior year. To enter the program the student chooses a faculty member to act as advisor for work in distinction, prepares a proposal, and attaches the proposal to a petition for work in distinction. The distinction project is completed during the senior year. Persons who complete the program to the satisfaction of their advisory committee will graduate “With Distinction.” These students will receive up to five hours of Independent Study with the grade of A and the words “With Distinction” will be included on the diploma and commencement program. Interested students should contact program coordinator Dr. Sarah Bouchard, Director of Undergraduate Research and Creative Work. The Honors Program at Otterbein University is a rigorous and exciting program of study for students of high academic ability and strong personal motivation. We offer a unique academic experience for intellectually invested students. The Honors course sequence begins with small, discussion-based seminars taken in the freshman and sophomore years. In the junior and senior years students work closely with a faculty advisor of their choice to pursue an independent research or creative project in their individual field of study. The University Honors Program prepares you for a rewarding professional life after graduation. We foster a culture of research, responsibility, and self-reliance that will shape you as a citizen and community member. Students selected to participate in the Honors program enroll in selected HNRS-prefix courses that are designated for Honors students only. These courses substitute for INST requirements (as listed below). Honors students are eligible to register for classes one day early each semester. Admission to the program requires (1) a minimum ACT score of 27 or a minimum SAT score of 1220, and (2) a top 10% rank in the high school graduating class or a minimum 3.8 GPA. Entering freshmen who do not meet the above criteria may request entrance into the program based on partial qualifications and recommendations. Requests should be made to the Office of Admission. Current students with a 3.5 GPA may be recommended for entrance into the program by a faculty member. The recommendation must be sumitted by the end of the student’s freshman year. Submit recommendation letters via email to the Honors Program Director. Students must maintain a 3.5 GPA and good academic standing to continue in the Honors Program (subject to Director discretion). Students sanctioned for academic dishonesty (e.g. plagiarism) will be dismissed from Honors. In the freshman and sophomore years, students take three Honors seminars that substitute for core curriculum course requirements (Integrative Studies (INST) courses): one freshman Honors course in composition and literature (HNRS 1500) and two sophomore-level Honors courses (HNRS 2000, 2200, 2400, or 2600). Sophomore courses are offered in a range of fields including art, religion and philosophy, sciences, history and political science, and social sciences. The junior and senior years are devoted to the independent Honors Project. Juniors participate in an interdisciplinary workshop, the Honors Project Seminar (HRNS 3500), to begin preliminary project research; during the senior year, students work with a faculty advisor of their choice to complete their projects (HNRS 4500). On Honors Reporting Day, held annually in April, graduating Honors students share and celebrate their research and creative achievements with the campus community. Honors students are eligible to live in the Honors residence hall, Mayne Hall. This living-learning community gives students the opportunity to engage with other Honors students and participate in special activities planned just for Honors students. Participation in the Honors Program will be recognized permanently in two ways: Honors courses will be noted on academic transcript record via the HNRS prefix so that potential employers or graduate school admission committees will recognize that level of work completed, and “With Honors,” will be noted on the diploma. The Honors designation will also be included in the commencement program and announced as the diploma is presented. The Honors Program is directed by Dr. Karen Steigman of the Department of English. To be included on the Dean’s List, a student must complete at least 12 hours in a semester (Fall or Spring) with a grade point average of at least 3.600. Inclusion on the Annual Dean’s List requires a student to be on the Dean’s List for Fall and Spring semesters of the academic year just completed, or a full-time student both Fall and Spring semesters in the academic year with a grade point average of at least 3.600. The Dean’s List is compiled by the Office of Academic Affairs. Dean’s List congratulatory cards are sent from the Office of Academic Affairs, 614-823-1573. Announcements to local newspapers are sent from the Department of Marketing and Communications, 614-823-1600. Undergraduates may receive honors recognition at graduation based upon overall grade point average (Latin Honors) or participation in The Honors Program or participation in The Distinction Program or grade point average in the major. Latin Honors will be recorded on the permanent transcript record and on the diploma. It will be noted in the commencement program and announced as the recipient is presented the diploma. For Honors Program recognition, a student must have completed the requirements of the honors program. Honors Program Honors will be recorded on the permanent transcript record and on the diploma. It will be noted in the commencement program and announced as the recipient is presented the diploma. A medal is worn at commencement. To graduate With Distinction, a student must satisfactorily complete an approved program of independent study and research, submit a thesis and pass oral and written examinations on the field studied. With Distinction Honors will be recorded on the permanent transcript record and on the diploma. It will be noted in the commencement program and announced as the recipient is presented the diploma. A medal is worn at commencement. For Departmental Honors at graduation, a student must have achieved a 3.700 grade point average for all courses in the major by the end of January Term. Students who are seeking a second Bachelor’s degree (first one already awarded) are not eligible for Departmental Honors. Departmental Honors will be noted in the commencement program. A pin is worn at commencement. All requests to audit courses are subject to final approval by the Office of the Registrar. Confirmation or declination will be sent shortly after the registration is processed. Among courses that may not be audited are those that consume laboratory, computer or other additional program resources and those in high demand by credit-seeking students. Demand fluctuates which means that at some point in time any course has the potential of not being available for audit. Audit expectations are determined by the instructor and thus may vary from course to course. It is the student’s responsibility to discuss expectations with the instructor prior to the start of the class or no later than the first class meeting. Changes from audit to credit or credit to audit must be made during the published add/drop period. A grade of AU will appear on the transcript record. An audit may not be substituted for a required class; the required class must be taken for credit. Full-time students are not permitted to audit courses. With instructor permission, a student may unofficially sit in on a course. For Fall and Spring Semesters, the deadline for adding a class that begins in the same semester is the second Monday of the semester. Deadlines for courses that are shorter than the usual 14 week semester (including Summer Semester, Cardinal Term and May Term) are published on the Office of the Registrar’s website. After Friday of Week 9, withdrawal is not permitted and whatever grade is assigned by the instructor will be recorded on the transcript. Deadlines for courses that are shorter than the usual 14 week semester (including Summer Semester, Cardinal Term, and May Term) are published on the Office of the Registrar’s website. Students who wish to withdraw from all classes that began in the same semester must officially withdraw from the University by completing a withdrawal form at the Office of the Registrar or faxing a letter requesting withdrawal to the Office of the Registrar 614-823-1009. The date of withdrawal is the date the notice is received by the Registrar. If a student never attends any classes or stops attending without officially withdrawing, the registration will not terminate. Grades will be assigned under the grading criteria used to evaluate all students in each course and the student will be responsible for all fees and tuition charges for the class or classes. Nonattendance and/or nonpayment of fees do not constitute official withdrawal. Students enrolled for 1-11 hours during Fall, Spring or Summer Semesters will be considered part-time. Students enrolled for 12 to 18 hours during Fall, Spring Semester or Summer Semesters will be considered full-time. During Cardinal Term or May Term, a student may enroll for 1 course. For Fall and Spring Semesters, an academic overload is 19-20 hours. An overload is permitted when the student was enrolled full-time and achieved a cumulative grade point average of 3.0 the preceding semester. New students may not take an overload during their first semester. No student may register for more than 20 hours in a semester without the approval of the School Dean who overseas the department housing the student’s major. For Cardinal Term or May Term, no academic overload is permitted. For Summer Semester, overloads of 19-20 hours are not permitted due to the accelerated pace required for fewer weeks of study. No student may register for more than 18 hours without the approval of the School Dean who overseas the department housing the student’s major. The student must be in good academic standing and enrolled full-time at Otterbein (12 or more hours of Otterbein coursework; this excludes the hours of the cross-registered course). If the student drops below full-time status at Otterbein, withdrawal from the cross-registered course will be required. If the cross-registered course is to be taken at an institution from which the student transferred, the student must have departed that institution in good academic standing. A course taken through HECC cannot be one that is offered by Otterbein (the determination as to whether the host institution’s course is similar to Otterbein’s will be made by Otterbein). The program may not be used to resolve scheduling conflicts. The student must be able to demonstrate that any prerequisite course knowledge has already been met. The student must first make an appointment with Otterbein’s registrar to obtain registration approval. Once approval is received, the student must then register at the host institution. A combined total of hours carried at Otterbein and the host institution may not exceed 18 unless a 3.0 GPA was achieved for a full-time load the preceding term. If a 3.0 was achieved for a full-time load, a maximum of 20 hours may be carried. No student may register for more than 20 hours in a semester. Cross-registration is limited to one course per term and three per lifetime. The lifetime total is the total for all institutions attended. In other words, if two cross-registered courses are taken while enrolled at Otterbein, only one more may be taken if the student transfers to another HECC institution. ROTC courses at Capital University and The Ohio State University are not restricted to the three-course lifetime limit (may be taken as many times as required by the ROTC affiliate). The program is available in Fall, Spring and Summer Semesters. Written permission is needed in order to take graduate level courses. Usually, this coursework does not count towards undergraduate degree programs. Permission forms are available in the Office of the Registrar. Independent study is an opportunity for qualified students to work in topics of special interest or areas not otherwise available through the standard curriculum. The course content is determined by the student and the faculty member collaboratively. A maximum of 12 semester hours may be taken as independent study (3900 course number) during a student’s undergraduate career. Of that 12, no more than 8 semester hours may be taken in the major or minor. The hours for Distinction Research are excluded from these restrictions. Students are required to self-monitor the independent study hours they accumulate and not exceed the 8/12 hour restrictions. Excesses will be noted by the Office of the Registrar at the time the student makes application for his or her degree. At that point, however, graduation may be severely jeopardized. The degree requirements of the University in effect at the time of the student’s first enrollment are those which must be met for completion of a degree program. Subsequent changes in degree requirements may be substituted with the approval of the department chairperson or Academic Council, whichever is appropriate. Students who interrupt their enrollment at Otterbein University or in an Otterbein University approved program for longer than 12 consecutive months must meet the requirements for graduation as published in the catalog at the time of re-enrollment. In some instances, changes in departmental requirements must be applied to students who have already enrolled. In such instances, the new requirements will apply in a manner that will not require a student to carry more than a full-time load otherwise not required in any semester and will not prolong the time required to complete the degree requirements. Department chairpersons have the authority to waive or provide substitute course work for departmental requirements. Prerequisites (prereq) or corequisites (coreq) are requirements which are judged necessary for the successful completion of a course. Students who register for a course without taking the prerequisite or corequisite are subject to being withdrawn from the course by the instructor or the Registrar. Waiver of the prerequisites for a course is generally discouraged but may be done occasionally on a case-by-case basis. This waiver may be granted only by the instructor of the course after that instructor’s assessment of the specific student’s history and experiences. Prior to granting the waiver, the instructor must be reasonably assured that the student has had courses, background experiences, or abilities which would generally be equivalent to, or serve to negate the necessity of, the prerequisites. The instructor must also be reasonably assured that the student will not be at an educational disadvantage compared to students who have completed the prerequisites. Waiver of a prerequisite by the instructor does not, expressly or by implication, constitute a representation or assurance of the successful completion of the course. The student remains fully responsible for his/her performance in the course. It is the student’s responsibility to assure that a prerequisite has been met. New students register for classes just prior to the term in which they enroll. Currently enrolled students typically register for the entire forthcoming academic year during the preceding Spring. Priority to register for upper level classes is given in the preceding Spring to students with disabilities and seniors first, then juniors and then sophomores. To participate, a student must (1) be enrolled for the current Spring Semester, (2) have paid all current academic year bills, and (3) have no official transcripts still due to the University. There is no priority registration after Spring. Students, including those with senior status, who register from that point on may encounter some closed courses and will likely wish to use the wait list system. A written detailed description of the wait list process is available on the Office of the Registrar’s website. The University reserves the right to refuse registration to a student who is failing to make satisfactory progress toward his or her degree. The repeated course must be either (a) the same Otterbein course that was originally taken or (b) the direct equivalent at another institution as determined by the Office of the Registrar. When in doubt, obtain written clarification from the Office of the Registrar. No other University personnel are authorized to make the clarification. If a course has been transferred to Otterbein and is then repeated at Otterbein, there will be no credit awarded for the course (not even elective credit). Courses must be repeated at Otterbein unless written permission to take the course at another institution is obtained from the Office of the Registrar. When the repeat is finished, the Office of the Registrar must be notified so that the repeat can be recorded. The credit hours must be the same in order to replace the grade in its entirety. Only the most recent grade and hours will be counted in determining the GPA even if the most recent grade is lower than the previous one. All attempts and grades will appear on the transcript record. Courses repeated after graduation will not change the graduation GPA.